This CD is a collection of heartfelt songs the Lord has given me. The glory of the Lord was all around me while recording these songs, He was singing and playing through me. I was just open to Him. Basking in his love, resting in His will, and pouring out blessings on all who would listen. Each one is deep from the heart of God, and means a lot. May God bless, bless, bless you with them. Set Free includes all the songs listed below, and is one hour long. They are recorded in the unplugged acoustic style, no special effects, as if I were singing and playing my guitar in your living room. Except for lyrics to 8, all songs are written by Brother Bear. Hear them as they sound on the CD, in the Audio section. My thanks to all those who have made this possible: My parents who prompted my initial relationship with God, and have encouraged me all the way. The Mead family who were part of the original inspiration for me. Pastor Steve Allen who gave me a good understanding of music. Don West who has brought me closer to God, and has taught me things on guitar, song writing, and copyrighting. Joseph LaQuiere who has been an invaluable help in recording equipment/technique. Ric Alessio who made all the sheet music. Nate Boyd who made the web site. And to the many more who have been an inspiration to me. As of 2-7-04 Brother Bear CDs are free, and refunds are being issued for all prior purchaces (explanation). If you bought one previously, please e-mail me. 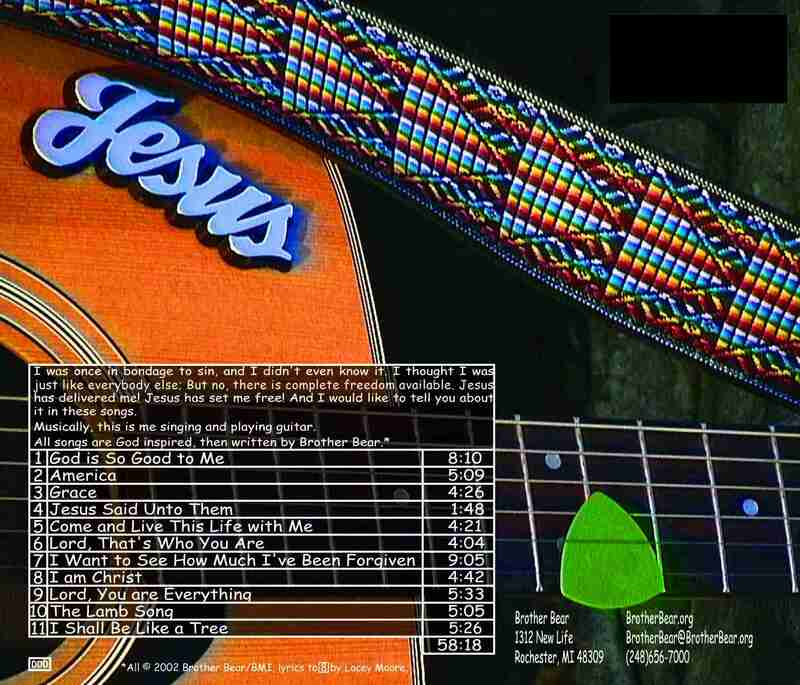 You can Order the Free Brother Bear CD here, or the Set Free Album from the following companies. 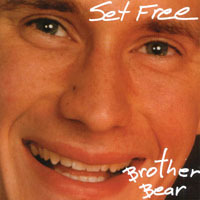 Search for "Brother Bear Set Free", or ask for Set Free, by Brother Bear on the phone. Brother Bear Free CD or Download Order Form (248)656-7000 8am-9pm EST Sun.-Sat. CD Baby CD or Download CDBaby.com (800)448-6369 9am-9pm EST Mon.-Fri.
Tower Records CD or Download TowerRecords.com (800)ASK-TOWER 9am-9pm EST Mon.-Fri.